Home > Introduction to Wine > What Defines a Wine? Wine is something so prevalent throughout society in Western Europe (and indeed even in the U.K. where we are often lambasted for our lack of Wine savvy) that it would almost certainly have to constitute one of the pillars of our cultural life, alongside food, art, literature, music and but a few more. Despite this, there remains in the U.K. a real lack of confidence amongst many people when it comes to talking about a wine. The question ‘What is Wine’, may then meet with a hesitant reply: The reply would then be a mumbled: An alcoholic drink made with grapes?’ And this, in fact, would be completely right. That is all there is to a wine – a beverage made from fermented grape juice, using grapes from the ‘vitis vinifera’ variety. Yeast is essential to this fermentation process. ‘Wine’ can be made from other products, such as Ginger or Elderflower, but these are not strictly ‘Wine’, but drinks fermented in a similar way. 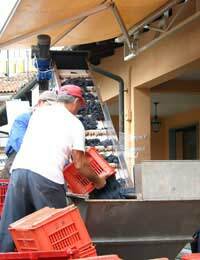 Red Wine: Wine made from red grapes, with the red skins left in during fermentation. The key to understanding red, white and rose here is the fact that grape skins give colour to a wine. A red grape without a skin would actually produce a white wine! White Wine: Wines made from either red, white, or a mixture of red and white grapes with skins removed early during fermentation. Rose Wine: Wines made from either red, white, or a mixture of red and white grapes, with the skins removed part way through fermentation. Sparkling Wine: Wines such as Champagne that are fermented for a second time in their bottles, thus producing bubbles. Dessert Wine: Wines made predominantly from the Semillon grape, these wines are very sweet, and therefore ideal for dessert. Fortified Wine: Wines such as Sherry, that have spirits (predominantly Brandy) added during fermentation, giving a higher alcohol content. Within these categories there are many different varieties of wine, sometimes referred to by the grape they were predominantly produced from, sometimes, by the region they are produced in. Slowly getting to know the difference between grapes and regions can help to increase ones enjoyment of wine. There are many rules regarding what wine should be drank on what occasion and what food it should be served with. Making a faux pas regarding this is the sort of thing that could get you scoffed at during parties and functions. However, the sort of people doing the scoffing in all probability have limited knowledge and are keen to hide that fact by offsetting their confidence issues onto others. The fact is that only an idiot pips for wine convention over personal taste, so just drink what you like in the context you are comfortable with, be honest and be confident in describing your choices, and you have nothing to fear. Now, having kept that simple, it should be possible through a reading of the other articles on this website to boldly go forth and discover those wines best suited to you – and that can be no bad thing!